The town of Swellendam was declared a magisterial district in 1743 and subsequently became the furthermost outpost of Dutch civilisation during the 18th century. The town welcomed artisans as it grew beyond the limits of the Drostdy (the offices and residence of the local magistrate). When the residents became disaffected by the inadequacies of the Dutch East India Company in 1795, they declared themselves a republic. However, the republic ended with the occupation of the Cape by Great Britain, although Swellendam prospered as the interior was populated. The independent spirit of Swellendam has remained and the town re-branded itself as a “Republic” in June 2011. Although the re-branding is tongue-in-cheek, the community is serious in its dedication to the principles of the New South Africa and it celebrates rural life, racial harmony, respect for nature and wildlife whilst promoting art, music, good food and beauty. It was in this town, at the foot of the Langeberge, that Craft Editions met one of our first featured makers, ceramicist John Newdigate. The drive towards Swellendam through the Overberg, an area known as the breadbasket of South Africa, is marked by a landscape of undulating wheat fields. These fields, dusty and bare after the harvest, appear to be cocooned, all round, by enveloping mountains that rise up, covered in lush growth fed by an abundance of water. After the dry, earthy, ochre shades of the agricultural fields, the cutting contrast of verdant greens surrounding the town amplified our expectations as we arrived for our meeting with John. John, a native of the Cape, has worked professionally as an artist and ceramicist since 1991. John makes ceramics in a variety of shapes and sizes, but they all have in common their reflection of their maker’s close relationship to the landscape and its bounty through their form, surface decoration and function. John grew up on the Cape Peninsula, working as a deckhand on fishing boats during school holidays as a child, and even full time for a short while, later as a young adult. The impact of this life in, on and near the sea is evident in much of John’s work: Platters decorated to mimic patterns of plankton and phosphorescence, bowls that show fish darting through translucently shimmering water and vases decorated with the pattern of rippling water. Patterns often repeat with near mathematical precision. More recently, John has relocated to a mountainside home bordered by a clear stream and enclosed by a lush growth of trees and plants that teem with birdlife. Inevitably, the transition in the landscape that surrounds him has also been reflected in John’s work. Recent pieces reflect the views of the town buildings and their roofs through the trees or the birdlife around the stream. John’s colour palette has also developed in tandem with the change. The use of sea-tones has broadened to include citric yellows, earth tones and crimson. All John’s work is meticulously made by hand – either slip-cast from original moulds he has made himself or, for larger pieces, by building unique forms with coils. Shapes are deliberately kept simple – footed bowls or platters and pot-bellied jars and vases – the result of a conscious decision to allow form to support and carry the painterly finish of the final product rather than wrestle with it. John uses semi-porcelain for strength. The vessels are mid-fired to just the point of near-vitrification (cone 5-6 or 1220°C). This produces a product that is more durable than it would have been if he had used earthenware and allows him greater freedom with colour. And colour is key in this case, for anyone that has seen his work invariably agrees that it is the visual impact of the radiant surface decoration that leaves a lasting impression. John is an exuberant colourist and this fascination has led him to abandon reduction-firing techniques in favour of underglaze painting. The latter technique is not new – the blue and white wares that came from China during the Ming Dynasty and the more colourful Iznik pottery from the Middle East are historical examples of the excellent use of underglazes. 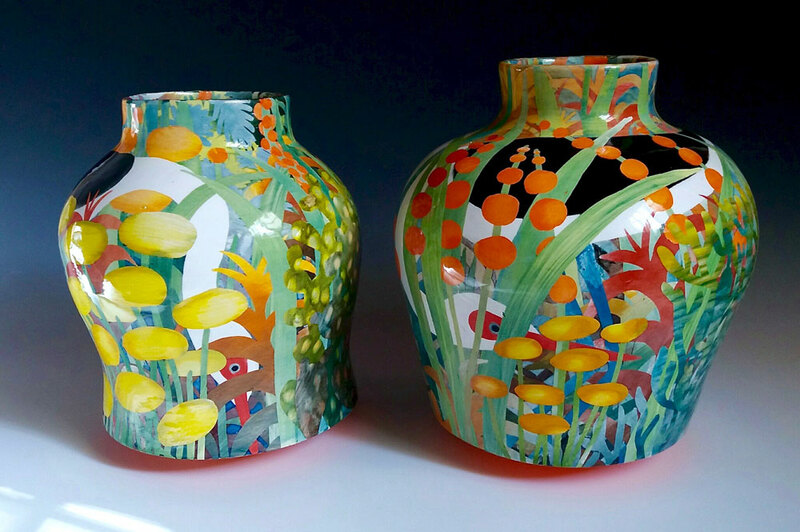 However, it is only relatively recent developments in technology that have allowed ceramicists a wider range of prepared colours that can be fired at higher temperatures under a protective glaze. This has allowed greater experimentation with the use of clay as a canvas for painting on. John exploits the new range of colours to its full advantage in his work. He uses multiple washes of colour to build subtle, yet rich, layering. Some aspects of a design might be reserved with wax, whilst others are emphasised by over painting. Complex patterns emerge, translucent and radiant. A mix of sharp and blurred lines gives depth and perspective, but the net effect approaches abstraction rather than representation. Leaves and foliage are magnified to jungle proportions. The surprise of discovering two birds glinting through foliage, seemingly interacting with each other from inside and outside the bowl, is nothing but joyous. Each piece is fired at least three times to allow the desired layering and depth to develop. An appreciation for the detail implicit in this time-consuming production process is what makes John’s work so wonderful and ultimately valuable. At Craft Editions, we admire objects that bear the marks of the hands of their makers. Ceramics in particular, are directly shaped by the impact of the actions of the people devoted to their creation. In John’s work, we see these marks in every aspect. Clay material is carefully shaped to the determined wish of a craftsman. The treatment of the exterior surfaces reflect his patience and love in the way that shape and surface combine effortlessly in the thoughtful and artful expression of his vision. Thanks to John Newdigate for sharing his story. Find out more about John Newdigate here. Images courtesy of John Newdigate.